NEW YORK — Jussie Smollett marked a breakthrough in 2015 when the TV series ‘‘Empire’’ debuted, launching his career after working in the industry for years, earning Emmy and Grammy nominations, and even getting a record deal with Columbia Records. 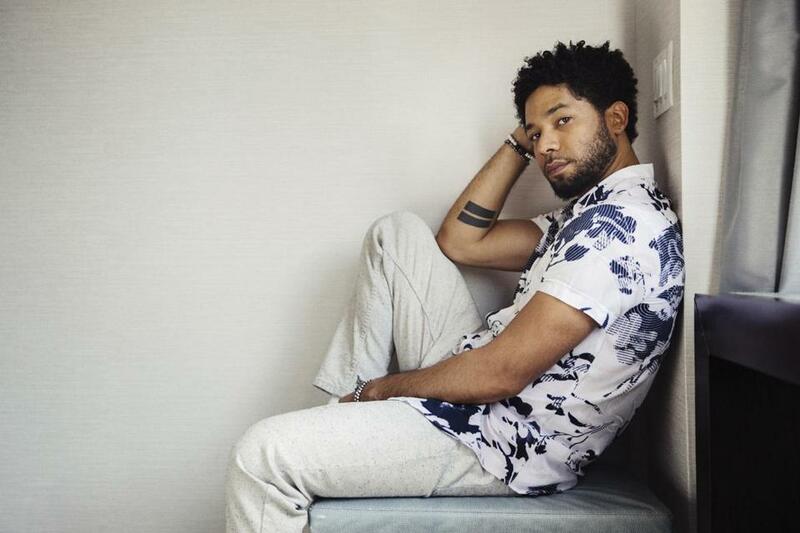 The anticipation had built around Smollett and his fame, with feverish fans constantly wondering when he would release music apart from his Jamal Lyon persona. But the songs never came, and Smollett said he had to break away from the Sony label to finally have his voice heard. ‘‘I was sitting in a room full of old straight white men, playing them the stuff that I’d put my heart and soul and my pain and my joy in, and they’re telling me what piece of that should be heard by the people that it actually was created for. I’m like, ‘Well that doesn’t feel like freedom,’ ’’ Smollett recalled in an interview with the Associated Press on Tuesday. Smollett finally put out his debut album, ‘‘Sum of My Music,’’ recently, releasing the 10-track set independently on his own label, Music of Sound. Smollett, 34, talks about his music and performing at Prince’s nightclub in Minneapolis while he filmed ‘‘The Mighty Ducks’’ more than 25 years ago. Q. When you released the song ‘‘F.U.W,’’ and its music video last year, that was on Columbia . . .
A. Was it really, though? They put their name on it, but was it really? A. I paid for everything. . . . There’s no bad feelings at all . . . [but] I got no support over there. The good thing is that my ego is strong enough that I’m just like, ‘‘If you’re not [feeling] me, I just want to go.’’ And that’s with any situation — whether it’s a business relationship, an intimate relationship, a friend, whatever. Like, if you ain’t [feeling] me, boo boo, I can go. It’s all good. And of course there was a bit of that fear of the perception, that you don’t want the perception to be that you got dropped. ’Cause the second that that’s the perception, then it’s a thing of like, ‘‘Oh my God! People are going to think you’re a loser or you’re not good before they even have a chance to really hear the music that you’re doing.’’ And it wasn’t that at all. It just wasn’t a fit. Q. Was it easy to get out of the Columbia deal? A. It was. It wasn’t that it was easy, but at the end of the day, Fox was the one that had the power, so once I convinced them, then I was able to just pull it back. Because with every single success or failure of ‘‘Empire,’’ I feel like my stuff was somehow neglected because of it. . . . And it happened too many times, and it was a thing like, ‘‘. . . This is going to be the time when you’re album comes out.’’ And I’m like, ‘‘So I can announce this?’’ And I announced it like two different times and it never came out. And I’m like, ‘‘What the [heck]?’’ I’m looking like a [dummy] to my fans. Q. The album opens with the personal song ‘‘Insecurities’’ — what was it like writing and recording that? Q. How do you feel like you’ve grown since ‘‘Empire’’ premiered? A. I want to say that I believe in myself a little bit more. I think that after the first season, if I’m being honest, my self-esteem kind of did a dive. . . . I had been myself my whole life but I wasn’t used to . . . the scrutiny that came with fame and that came with being a part of a phenomenon like ‘‘Empire,’’ but also being a part of a phenomenon that is Jamal Lyon. . . . He’s a groundbreaking character, and I was kind of thrust out there. And everybody just wanted to talk about my life, and everybody wanted to know what I was doing. And everybody had these expectations of what I should be, how I should be, who I should be seen with, what I should be doing, who was I dating, who was I [sleeping with]. And I just wasn’t used to that. . . . I know that I believe in myself much more now. I’m much more certain of what I want, and how I want it. Q. You starred in 1992’s ‘‘The Mighty Ducks.’’ What goes through your head when you think about that moment in your life?? A. That was four months in the freezing cold in Minneapolis. One thing that sticks in my mind specifically is I remember going to Prince’s nightclub that he had, and performing there when I was 9 years old. A. Yeah. [With] my siblings and Brandon Adams, who played my older brother. Don’t ask me why or how, I don’t even remember how. I’d have to ask my mother. Q. Well, you never know with him. A. You never know. I think that I remember someone say, ‘‘Oh he’s up in the balcony.’’ But then being like, but I think that they were lying. I remember it being freezing cold. And then honestly I remember over the last years how, whenever ‘‘Mighty Ducks’’ would show on the television, I knew that . . . six weeks later I was about to get a $400 check, my residuals. And I’d be calling up SAG with my broke [self] being like, ‘‘Uh, run that check, run that check.’’ Those are the days when I had $17 in my account and I had to find $3 to deposit, so I could take $20 out.